Normally, at a Japanese wedding reception, called hiroen, only family, relatives, close friends, bosses from work are invited. The rest of the people with whom the couple still wish to celebrate their union will attend the after party, which they call nijikai. After you have stressed about what to wear, next thing to stress about is the wedding gift - what to give? Well, that is just very simple. Japanese people will give cash as a wedding gift to help recover some of the cost of the wedding. But, oh my god, how much to give?? Unless an amount is indicated on the invitation, normally, they will give about 30,000 to 50,000 yen per person. It may sound very expensive, but if you compare the cost of a Japanese wedding, which this one in particular I was told it cost about 4,000,000 yen, divided by 100 guests (which is how many they had for this one), it works out to be about 40,000 per person. But the Japanese will never give an amount that can be easily divided into two because that is just bad omen, so they will either give the next odd, round number. The closer you are to the couple, the more you will give. And if you are a student or unemployed, then you won't be expected to bring any significant amount of cash gift. Once you have determined your amount of cash gift, you need to put it into a special envelope, shuugi-bukuro. You can get one from any stationary, paper craft, or Daiso (dollar store) in Japan. If you're lucky enough to have a Daiso store in your non-Japanese town, they would have them too. Choose an envelope with bright colours and a non-flower type of mizuhiki cord ornament on it. The above envelope has a crane mizuhiki cord ornament on it. Do not choose a black and white envelope with characters ご霊前, ご仏前 or 御供物, those are for funerals. There are very specific ways to address a shuugi-bukuro. You may be given strips of paper for the outer front envelope. You can choose ones that says 御結婚, お祝い or 寿 on it. 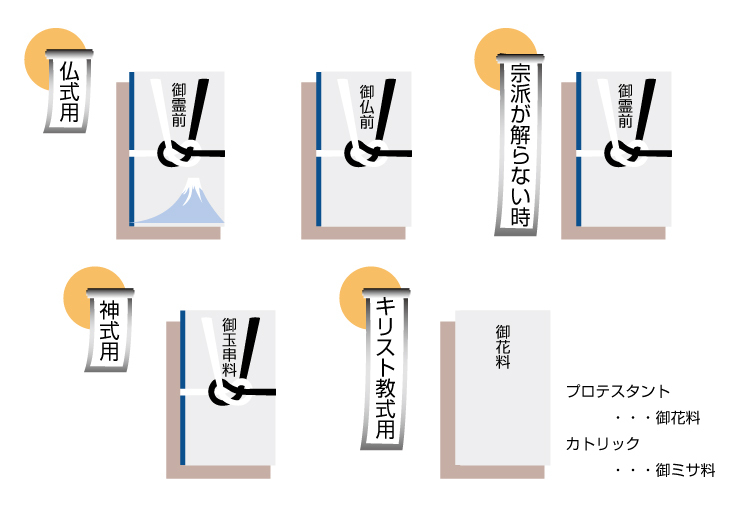 On that strip at the very bottom, starting from the right hand side, write vertically (in kanji if you can) the names of the recipients, with the most important person on the most right hand side. There is an inner envelope. Loosen the mizuhiki cord to unwrap the outer envelope to get at the inner envelope. On the center front of the inner envelope, write vertically (in kanji if you can) the amount you are enclosing. On the back side of the inner envelope, on the bottom left hand corner, put your name and address down. Insert your money, using new bills, with the face of the bills facing up as the front side of the inner envelope, so that when the recipient opens the envelope, he can see the amount written on the envelope and the face of the bills. Tuck the inner envelope into the outer envelope, front side to front side, back side to back side. Put the mizuhiki cord back on. The back side of the outer envelope has an upper flap and lower flap. Place the LOWER flap over the upper flap. This symbolizes that luck and happiness is rising. The other way around would be done for funerals to symbolize eyes down for the sad occasion. There is also a specific opportunity to give these cash gifts. At the wedding I attended, after photos were taken on the garden terrace, we were escorted into another waiting room where we get to sign the guest register, give our gifts and receive a reception program book. Guests have the opportunity to sign the guest book and give gifts. Guest book and gifts are separated by bride's side and groom's side. Finally, we were escorted to the reception hall. The closer you are to the bride and groom, the further away you sit during the reception, therefore, immediate family will sit the furthest away. There are various activities and entertainment during the reception, and of course, speeches. In my honest opinion, the entertainment are just part of the monkey show that the couple had to put on for their guests. It was cheesy but still enjoyable. Now, you may have noticed that the bride's outer coat, uchikake, has been changed. This one can be called an iro uchikake. It is also a very heavily brocaded silk coat. Brides will usually choose bright colours such as red for this happy occasion. In Japanese, they do not use the word "cut" but rather "put the knife in"
Many Japanese couples, despite doing a traditional wedding, will also change their clothes into a Western style set. Partly for fun, and partly to show that they are also modern and can integrate well into today's society. We also did get fed. And it was definitely a feast! Not in terms of the amount of food, but the taste, quality and presentation of the food. Seikihan. Red rice cooked with azuki beans. At the end, as a parting gift, each person or family was given a bag of wedding favours filled with very nice goodies. And since this was a traditional Japanese wedding, the favours were also tradition items. A very worthy trip indeed!